Over the years, development in the fields of energy and electronics has promoted advances in information technology, biomedicine and energy. 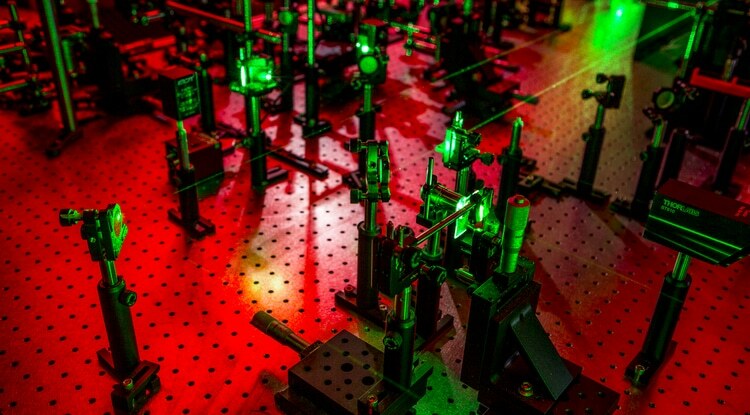 A team of researchers from the University of Arizona (UA) are introducing a new field - photonics. Photonics is the science of sound and has the potential to make significant impact. If engineers can get acoustic waves to travel in unnatural ways, as they are starting to do with light waves, our world could look and sound radically different. For example, visualize a Band-Aid capable of imaging tissue via the vibrations it discharges, a wall that allows one to whisper to a person on the other side but prevents you from hearing that person, or a computer that makes use of phonons - a type of particle that transmits heat and sound - to store, convey, and process data in ways inconceivable with traditional electronics. "It may sound like weird science, but I believe it is the wave of the future," Deymier said. The National Science Foundation's Emerging Frontiers in Research and Innovation (EFRI) program has offered $1.9 million to Deymier to lead a four-year research on influencing the way sound waves behave. Pierre Lucas, a UA professor of materials science and engineering, and Nicholas Boechler, assistant professor of mechanical engineering at the University of Washington also took part in this research. The UA is among the top nine U.S. universities to be given 2016 EFRI awards in the area of new light and acoustic wave propagation, or NewLAW. The awards were announced by National Science Foundation recently. Logically, the idea of reciprocity dictates that waves, such as electromagnetic, acoustic and light waves, act the same despite their direction of travel. Unless there is a material obstruction to break that symmetry, the method is symmetrical. When encountering a wall, sound and light waves lose energy, and may try to reverse course. The nine NewLAW projects are working towards breaking this symmetry of sound and light waves by making them travel in a single direction. So, a sound wave encountering a wall might carry on around it, or even be totally absorbed by it. Another UA researcher, professor Hao Xin in the Department of Electrical and Computer Engineering, has developed advanced materials capable of bending light in unnatural ways to make parts of an object invisible. Likewise, Deymier's study could pave the way for walls capable of letting sound to pass more easily in a single direction, or objects that stay silent when coming from one direction. Manipulation of photons and electrons forms the basis of most advanced technologies. Deymier is considered an expert in the emerging field of phononics, which covers several disciplines such materials science engineering, quantum physics and mechanics, and applied mathematics. He has created unique phononic crystals - elastic and artificial structures with remarkable acoustic wave propagation abilities, such as increasing the resolution of ultrasound imaging using super lenses or to process data using sound-based circuits. For the new NSF-funded research, he is using chalcogenide glass, an advanced material that has mechanical properties which can be dynamically changed in space and time to break reciprocity and transmit sound in one direction. The course of this exploration could finally result in a number of products with irregular features that could enhance ultrasonic imaging, noise abatement, and data processing technologies, Deymier stated. Imagine a computer whose operation relies on processing information transported by sound through non-reciprocal phononic elements instead of electrical diodes, or a medical ultrasonic imaging device with extraordinary resolution. Working with phonons is incredibly exciting. We're going to change the way people think about sound and are opening an entire new world.